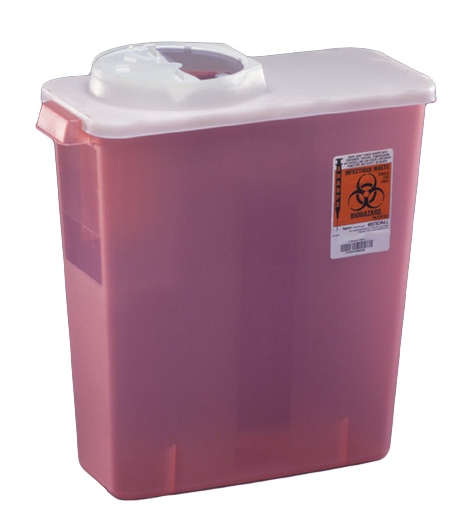 DialySafety Dialysis Sharps Disposal Containers BUY 3 Gallon Sharps Container, Rotor & Hinged Opening Lid Sharps Container, Sharps Disposal, 8964, Rotor Hinge Sharps Container. 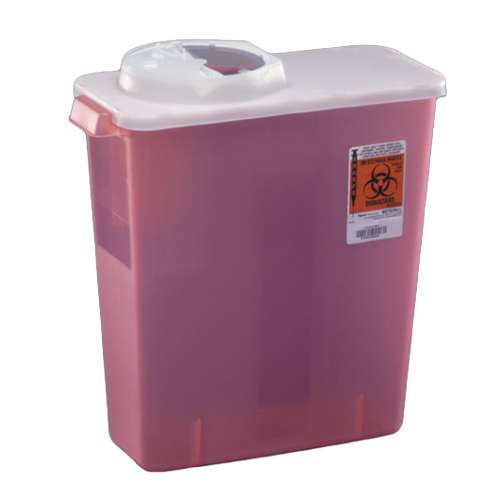 3 Gallon Transparent Red SharpSafety Sharps Disposal Containers with Rotor & Hinged Opening Lid is Designed for use in alternate care settings. Rotor lid adjusts to accommodate a wide variety of sharps, as well as infusion cassettes. Temporary closure limits unintentional opening. Final lock secures opening for disposal. Built-in handles for easy transport and disposal. Adjustable rotor lid to easily accomodate small and large sharps, including fistula needles. 3 Gallons.